Thank you so much for the opportunity to ask you questions about your work. It is a beautiful thing that you create poems in English that sound casual, and yet still retain the sound of the Latin. I have taken Latin courses both in high school and college, and have translated portions of Vergil’s Aeneid, so I thoroughly enjoyed reading your translations and notes from the text in poetry form. Thank you for these kind words, and thank you for taking the time to formulate such insightful questions. I appreciate the interest! Is there a place you can note in your chapbooks that you had the most enjoyment creating a poetic form, a place where you found that the poetry flowed more easily than others? There the poetry gets pretty telegraphic, there’s a lot omitted, trimmed back, I wanted to give a sense of movement and space, almost like a montage. It was the first time I really felt that I was doing something different, translation-wise…. Did you solely look at the text of the Aeneid or were you also influenced by outside sources? I was strongly influenced by Thomas Meyer’s Beowulf, which I edited for punctum books in 2012, and the world of translation that Meyer’s work opened up for me. Translating not only the words but the form of the poem became an obsession and guiding principle: how might we think about constructing an epic poem in today’s world, in which readers have totally different expectations than Romans, not to mention different ways of experiencing a text? So – following modernist and post-modernist approaches to long-form verse, I tried to think in terms of things like negative space, the visual arrangement of the words, subtext and intertextuality, ways of seeing and reading, and so on. 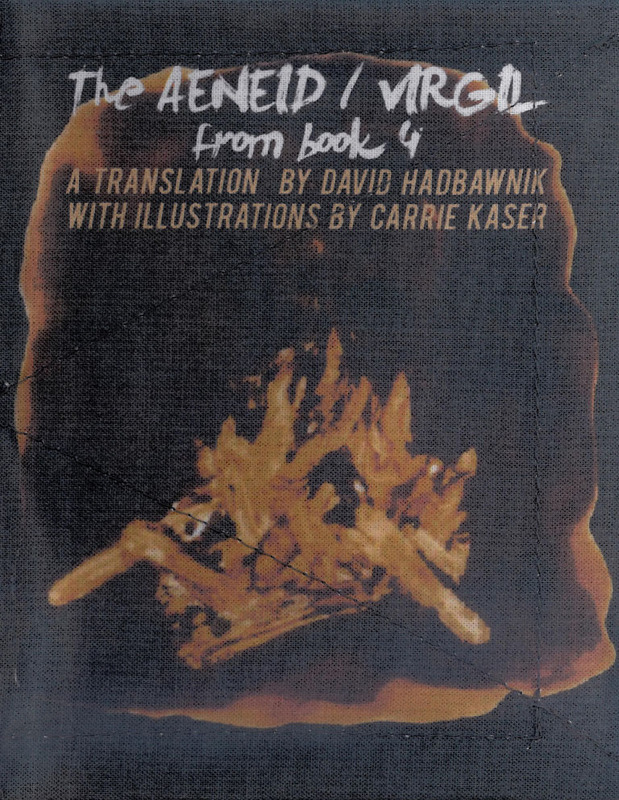 I didn’t keep any other books in front of me while I was writing, but I would allow the translation to be pulled in various directions based on what I was reading at the time (or had read and absorbed): long-form poems by H.D., Pound, Anne Carson, Ed Dorn, Basil Bunting, Meyer, and others. You end Book 2 with a note about the morning star rising, dragging day behind it. There are so many nuances and interesting moments that follow the Latin idea closely, and then here, you add a word to the familiar image like “dragging,” and the image of the light and the dawn becomes that much more intriguing. Did moments such as this one kind of just happen or were they more intentional? Well, there are so many beautiful, poignant, delicately constructed moments in the poem, and one of the revelatory things to me in working on the translation day in and day out was Virgil’s sense of pacing. Nothing ever feels rushed and nothing ever feels like it’s moving too slowly. And here we get a perfect image of dawn breaking just as the defeated Trojans are leaving the city. So in part I wanted to find a way to capture the feel of that moment, the sense of weariness and defeat, and in part there was a real test of invention in the fact that Virgil has so many different ways of describing dawn, sunset, and moonlight, most of them having to do with metaphors and personification based on mythology (though not really in this passage). I was constantly trying to find ways of hinting at this kind of personified agency in planets and stars and weather, so that readers could get the feel of that without having to unpack the myths. I found your portion of poetry on page 21 intriguing. You end it with the three elements Aeneas holds dear: “your wife children house hold gods RUN.” In your first chapbook of poems, you use RUN, and then you move to including more words in ALL CAPS in the second chapbook. You seem to be more comfortable with taking poetic “risks” in this second chapbook and also in your third. Can you speak to this? How did you give the translations your voice? Was it in small moments and words like this, or did it come through a particular structure you gave each chapbook? It just came through gradually. I’d been writing poetry for a long time and as I worked further and deeper into the poem, I grew more confident, less tied to the Latin, things started to flow and it felt like a collaboration between my own voice and the voice of Virgil’s poem. Each book has a distinctive feel – that’s especially true, I think, in books 1-6 – and I tried to find a form that would fit that, give the shape and thrust of the verse in the best light. In some later sections (not in the chapbook) I even included some prose-like blocks where I felt the language was particularly concentrated, everything jammed together with little or no punctuation. My guiding principle was to first, introduce some visual variety to the shape of the poem to give a modern reader something less static on the page, and second, to keep things moving. To me, the Aeneid is a page-turner; even though we know that Aeneas is not going to die on his journeys and he’s not going to fail in founding Rome, the amazing thing is that Virgil manages the impossible trick of building suspense into the narrative, and so it was important to me to be true to that feeling of suspense and speed of story. How did you choose when to include Latin? I was looking for little phrases that would best capture the sequence in question. The decision to separate each book into numbered sections was for my own and the reader’s sake; it helped me keep track of discrete bits of the narrative and (I hope) offers the sense of chapters within each book. At some point I began underlining passages that jumped out at me, turns of phrase that seemed appropriate for those chapter headings. So the first one, aequora tuta silent, reflects the (somewhat ironic) sense of safety and calm Aeneas and his men experience upon reaching the Libyan shore at the beginning of the poem. The next, O dea certe, is Aeneas rightly recognizing the disguised Venus as a goddess without recognizing her as his mother — it’s also a line that Spenser uses as a “motto” in The Shepheardes Calender, so it was meaningful to me in that way as well. And so on. Was there ever a point in the process of creating these three chapbooks where you felt stuck? Or you lost interest in the overall project? All the time. A lot of the work was done during my graduate studies at SUNY-Buffalo from 2012-2015 or so. I was working on my dissertation, on poetic diction in medieval-early modern poetry, at the same time, and constantly feeling the guilt (of not working) and frustration (of not being able to work) on that project as time went by. In some ways the translation was a distraction from that, in other ways a welcome relief. Then I would get discouraged just thinking about how much actual work there was to do on the poem ­— ars longa vita brevis, as they say — like, sitting at the beginning of Book 2 and realizing there were 700-something lines to go. How would I ever get there? I came up with an ambitious plan to do 50 or a hundred lines at a whack, but that quickly became too much for me. So instead I eventually got comfortable with the idea of translating 15-20 lines a day, which I could do in about half an hour, making sure that I got the sense of the Latin down accurately and satisfying any confusion I might have about this or that line. At that steady pace I could translate one whole book every six weeks or so. Then a different problem emerged: Would I be able to get back into the groove of working this into poetry? Since I generally waited until I had a whole book translated before writing what I’d consider the poetry, there might be a couple months or more between the actual creative process of this or that book. Sometimes I was not happy at all with the result, but I got into a rhythm and gained confidence as I went along. What is your hope for someone who reads your work? I want them to have fun, enjoy the poetry and the story and the images, and hopefully look into Virgil – ideally in the Latin. What advice would you offer to students interested in creative writing but also humanities and Latin? What are your thoughts on the relationship between literature like the Aeneid and writing poetry? Well, I think everyone should study languages and try their hand at translating. I don’t think it’s emphasized nearly enough in graduate creative writing programs – no one mentioned it as “real” creative work during my MFA, and even at the PhD level I had to do a lot of extracurricular studying to make it happen. I learned so much from engaging with the Aeneid, and in many ways I now consider it my life’s work, above and beyond whatever other creative projects I might pursue. In reading Paul Strohm’s recent, wonderful biography of Geoffrey Chaucer (Chaucer’s Tale), I was struck by his characterization of Chaucer’s relationship to fame. “Chaucer never actually calls himself an author,” Strohm writes, “nor would he.” Instead, Chaucer refers to himself as a “lewd compilator” – a compiler of others’ works. There’s a bit of the medieval modesty trope in that, but also something I find instructive: we’re all links in a chain of other writers, and that’s true whether we engage with the living (in “networks”) or dead (“tradition”). Something freeing, too; the amazing variety and play of a writer like Chaucer is something we can perhaps tap into once we let go of the baggage that comes with “authorship” and work in less obviously “creative” ways. I would say read a lot of chapbooks, look at the history of chapbooks from the golden age of print documents during the twentieth century and the various important presses, go visit an archive like the one at Buffalo, see what’s been done and what’s possible. And make chapbooks yourself. Learn how to run a letterpress machine and mix ink and set type, and make chapbooks for yourself and your circle of poets, because it’s money better spent than entering contests and waiting months and sometimes years to get a response. Then, if you still want to find a press to publish your chapbook, obviously you’ll want to read everything else that press has produced and get to know their ethos and make sure it jibes with your own. I was a big fan of Little Red Leaves – C.J. Martin and Julia Drescher were in San Marcos when I was studying at Texas State – and the Textile Series in particular; Dawn Pendergast does such lovely, and loving, work. What are you working on now? Are you hoping to publish more chapbooks of this sort? I finished books 1-6 and, though some of my friends really loved the form the project was taking in the sequence of chapbooks, with the beautiful textile covers with screen-print images and stitching, I wanted to gather all the material together in one place, and Shearsman published all of books 1-6 in 2015. Now that I am working on book 7, I’m not sure what shape further books will take in terms of publication, though two sections have been published recently in and seedings and Blackbox Manifold. Lately I’ve been working through Norton’s Anthology of Poetry as part of a class I taught on poetics, and in doing so I began writing “versions” of some of the more famous poems in the anthology, which I’ve largely posted on my blog as what I call “Palimpsest poems,” though there are getting to be enough for a chapbook, so you never know. Once again, I thank you for taking the time and effort to engage with my work.